Nearly a year after the San Antonio City Council unanimously approved what could be the most expensive water project in the region's history, some council members appear to be having doubts. Dubbed the Vista Ridge Project, the $3 billion-plus venture would pipe in 16 billion gallons of groundwater annually from Burleson County in Central Texas, about 142 miles away. The San Antonio Water System and many of the city's business leaders say the project is crucial to a secure future, but environmental advocates and other critics hotly dispute that notion, saying the city doesn't really need the water and that the project is far too costly and financially risky. This month, new concerns arose. 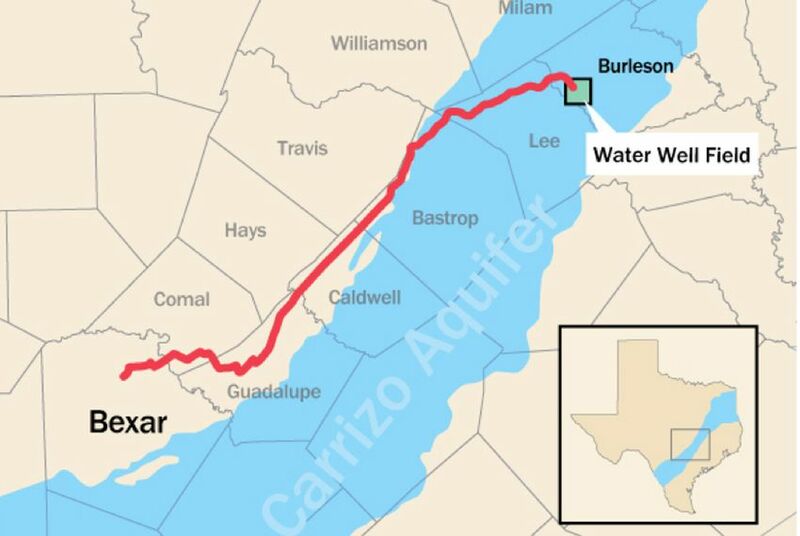 The Spanish company slated to build the pipeline, Abengoa, appears to have an increasingly troubled financial outlook, and research by a respected hydrologist suggests that pumping such a huge amount of water from underneath Burleson County could seriously impact other water users and the overall condition of the Carrizo-Wilcox Aquifer. "Is my confidence waning? Yes," Councilman Ron Nirenberg said in an interview. While Nirenberg voted in favor of the project last October, he also outlined four criteria it must meet to retain his approval: regional responsibility, commitment to conservation, fiscal responsibility and transparency. "So far, we've had some stumbling through all four," he said. Some of his fellow council members expressed similar concerns Wednesday at a planning session where they, along with Mayor Ivy Taylor, peppered water system President and CEO Robert Puente with questions ahead of their vote on a water rate increase to pay for it. That vote, originally scheduled for late October, has now been pushed back to November, City Manager Sheryl Sculley announced Wednesday — a delay Nirenberg and two other council members favored last week. "Vista Ridge is receiving a lot of scrutiny, as it should," Taylor said Wednesday. The city is asking council members to approve a 14.4-percent water rate increase, which would be phased in over the next five years, to pay for the project — part of a larger rate increase to cover federally mandated repairs to a neglected sewer system and other water supply projects, including a brackish groundwater desalination project scheduled to come online next year. By 2020, the average monthly water bill would reach an estimated $82, with $10 of that going toward Vista Ridge. Currently, the average household pays $54 per month. Nirenberg said he thinks the vote to increase water rates should be delayed until all concerns have been addressed. "We are talking about a 30- to 60-year decision that we’re going to be making, and we need to make sure we have all the facts on the table," Nirenberg said. In August, Moody's said it was considering downgrading Abengoa's credit rating, which is currently high risk, noting that the company "may be facing challenges to its business model in the financing of its projects." Abengoa was also recently hit with a class-action lawsuit alleging that it misrepresented the state of its balance sheet. On top of that, scientist George Rice released new data claiming that the Colorado and Brazos Rivers — two key water sources for many of Texas' major cities that are partially fed by the Carrizo-Wilcox from which Vista Ridge will be pumping — could see diminished flow as a result of the project. Puente, who has headed the water system since retiring from the Texas House of Representatives, disputed the accuracy of the report Wednesday, contending that "the data is wrong." He also expressed faith in Abengoa, explaining that the city was aware of the company's financial status and "took care" of the associated risk in its contract. He noted that the company has until early 2017 to secure the nearly $1 billion loan it needs to build the pipeline and, if it misses that deadline, would owe SAWS up to $2 million. What would happen after that remains unclear, however, Nirenberg noted. The councilman said he's also not happy the city has delayed releasing a comprehensive study on San Antonio's long-term water security he requested before the Vista Ridge. The San Antonio Express-News got a copy of a draft and reported that the Texas A&M University study was delayed in part for characterizing the Vista Ridge project as "high risk." Puente called the draft a "joke," and the lead writer, Calvin Finch, who worked for SAWS for 12 years in various leadership roles, was replaced after he retired. Puente told Councilman Ray Lopez Wednesday the final version would not be substantively different from the draft and that the new lead author's desire to have it scientifically peer reviewed was "one of the reasons why it's taken a little bit longer," along with edits that will make it easier to read. Though the final version is still not ready, Taylor posted a copy of the draft Finch wrote on her website. While at times, the report calls Vista Ridge "innovative" and important for San Antonio's water future, Finch also says the project could simply be perceived as the city "ignoring the interests of its rural neighbors ... so there is water for new San Antonians to water their lawns." Water system spokeswoman Anne Hayden said that despite the criticisms of Vista Ridge in the draft report, Finch made abundantly clear that the project is necessary. "There was some disagreement about the method of risk ... [but] the Finch report said it was needed," she said. Disclosure: The San Antonio Water System and Texas A&M University are corporate sponsors of The Texas Tribune in 2010. A complete list of Tribune donors and sponsors can be viewed here.